After years of near-misses, classic puzzle game Tetris is threatening to become a movie. Maybe if we show them how badly Tetris works with existing movies they will stop. Update 5/25: Thanks to the long weekend and a trip to Momcon in Atlanta for the contest judge, entries are open until Tuesday, May 31. Good luck! 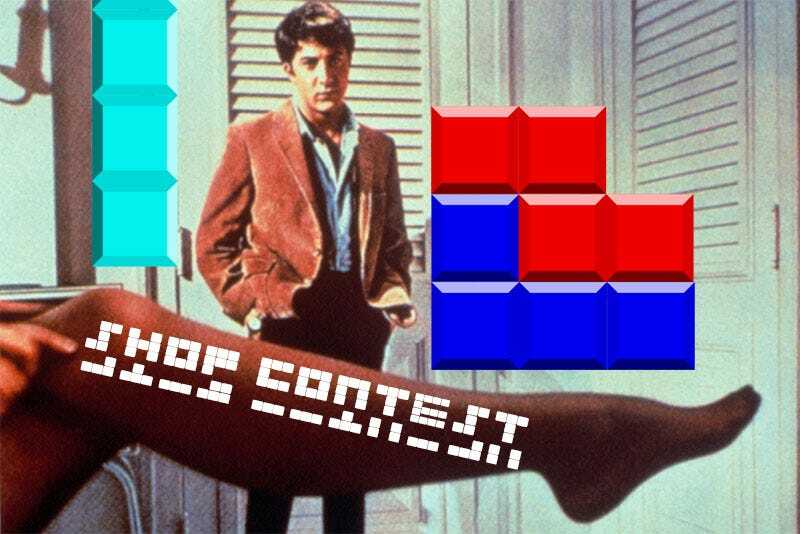 I don’t like to use the weekly-ish ‘Shop Contest to push an agenda, but an epic sci-fi thriller based on block stacking does not need to happen. Your task, should you choose to accept it, is to use these conveniently-grouped Tetronimoes to help stop the madness. Or at least make pretty pictures. Pick an existing movie and put Tetris in it. Simple. Possibly fun. Likely completely ineffective against this madness, but at least a little bit cathartic. Years from now we can re-up this post and dream of the Tetris movie that might have not been. I will give you all until Saturday morning to get your affairs in order. I suggest leaving a spot on the side of your affairs for long affair pieces.